The name "Gili Islands" is a bit of a misnomer, because Gili simply means "small island" in Sasak (local language).Tiga Gili [Three Gilis], Kepulauan Gili [Gili Islands]) are an archipelagi small islands — Gili Trawangan, Meno and Air, situated northwest of Lombok, to the east of Bali. With Bali being so famous, it has become very touristy and not at all convienient to people who wants to enjoy beutiful beaches. 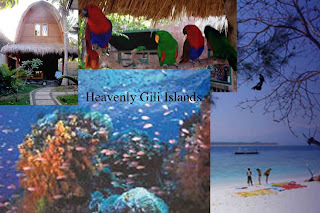 Gili islands offer you remote island experience.